A different device, the tin can telephone, or 'lover's phone', has also been known for centuries. It connected two diaphragms with a taut string or wire which transmitted sound by mechanical vibrations from one to the other along the wire, and not by a modulated electrical current. The classic example is the children's toy made by connecting the bottoms of two paper cups, metal cans, or plastic bottles with string. The telephone emerged from the creation of, and successive improvements to the electrical telegraph. In 1804 Catalan polymath and scientist Francisco Salvá i Campillo constructed an electrochemical telegraph. 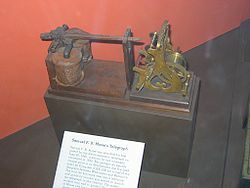 An electromagnetic telegraph was created by Baron Schilling in 1832. Carl Friedrich Gauß and Wilhelm Weber built another electromagnetic telegraph in 1833 in Göttingen. The first commercial electrical telegraph was constructed by Sir William Fothergill Cooke and entered use on the Great Western Railway in Britain. It ran for 13 miles from Paddington station to West Drayton and came into operation on April 9, 1839. During the second half of the 19th century inventors tried to find ways of sending multiple telegraph messages simultaneously over a single telegraph wire by using different modulated audio frequencies for each message. These inventors included Charles Bourseul, Thomas Edison, Elisha Gray, and Alexander Graham Bell. Their efforts to develop acoustic telegraphy in order to significantly reduce the cost of telegraph messages led directly to the invention of the telephone, or 'the speaking telegraph'. Credit for the invention of the electric telephone is frequently disputed, and new controversies over the issue have arisen from time-to-time. Charles Bourseul, Antonio Meucci, Johann Philipp Reis, Alexander Graham Bell, and Elisha Gray, amongst others, have all been credited with the telephone's invention. The early history of the telephone became and still remains a confusing morass of claims and counterclaims, which were not clarified by the huge mass of lawsuits that hoped to resolve the patent claims of many individuals and commercial competitors. The Bell and Edison patents, however, were forensically victorious and commercially decisive.